Update: I decided to create a facebook group to help people stop getting yellow pages. No pressure to join, just another way to share with others the good news and let Yellow Pages know how ridiculous you think they are. No idea if it will take off, but no harm in trying. Great news! 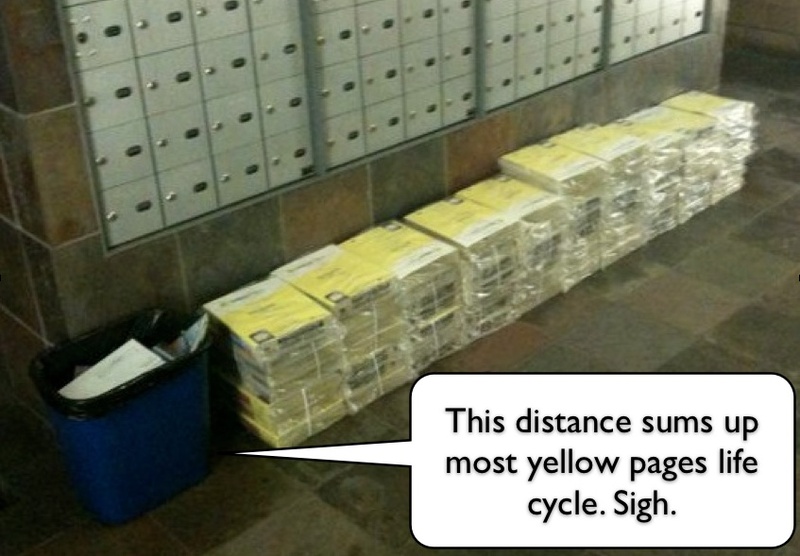 If you live in Canada you can stop the Yellow Pages from delivering their redundant, wasteful over-sized paper weight to your home. Simply fill out this form. I was renewed in my hunt for such an option after I saw this pile in my friend’s condo. Pretty much everything about this photo makes me angry. I have not used the Yellow Pages in over a decade and will never, ever, ever, ever use them (even their website which I am decidedly not linking to here) so long as they give them to virtually every Canadian address (I suspect that there are at least 20? 25? million, more? of these things printed every year? In our world this is spam. It isn’t mail I want, I didn’t ask for it and if I receive it, I delete (recycle) it upon arrival. I only wish the damage done by these books was as limited as online spam. 1) the fact you have to hand over personal information to a private company to stop receiving a service you never asked for is beyond offensive. 3. Is my registration permanment? No. Your registration is valid for two directory deliveries. After that time, you must inform us that you would like to continue to opt-out by completing the same form at http://www.ypg.com/delivery or calling 1-800-268-5637. 5. Will Yellow Pages Group send me a notice when the registration period expires? It will be your responsibility to register again to receive more directories or to be removed from the distribution list after two directory deliveries. Everything about this company is broken. With luck it will either change or not be with us much longer (also check out its shrinking stock value and declining dividend here). This entry was posted in commentary and tagged commentary, environmentalism, waste on June 14, 2010 by David Eaves. The only good thing about these yellow pages is as practice material for learning how to tear a phonebook in half with your bare hands. It's a good trick.